The New York Personal Injury Lawyers at Gair, Gair, Conason, Rubinowitz, Bloom Hershenhorn, Steigman and Mackauf obtained the second and the third highest personal injury verdicts in New York in 2017. With a total of 6 verdicts listed in New York’s Top Verdicts , our law firm has the highest number of listed verdicts than any other firm in New York. 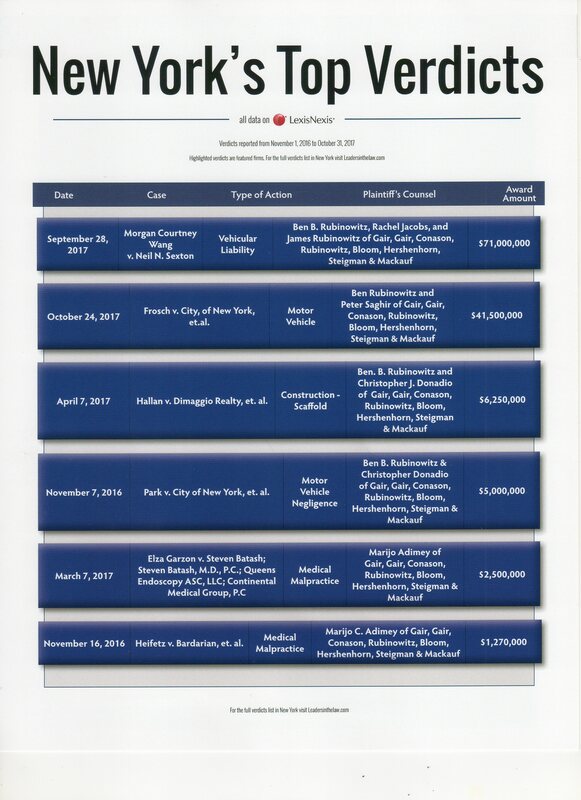 Reported by LexisNexis, The New York Top Verdicts 2017 covers all verdicts reported from November 1st 2016 to October 31st 2017 and appears in New York Magazine as part of the 2017 New York’s Leading personal Injury Lawyers section where our firm is listed.